Hey yall!! Week 2 of our After School Snack series!! It’s that time of year again! You know that when that school bell rings and your hungry kids coming piling in the door you better have a snack ready! 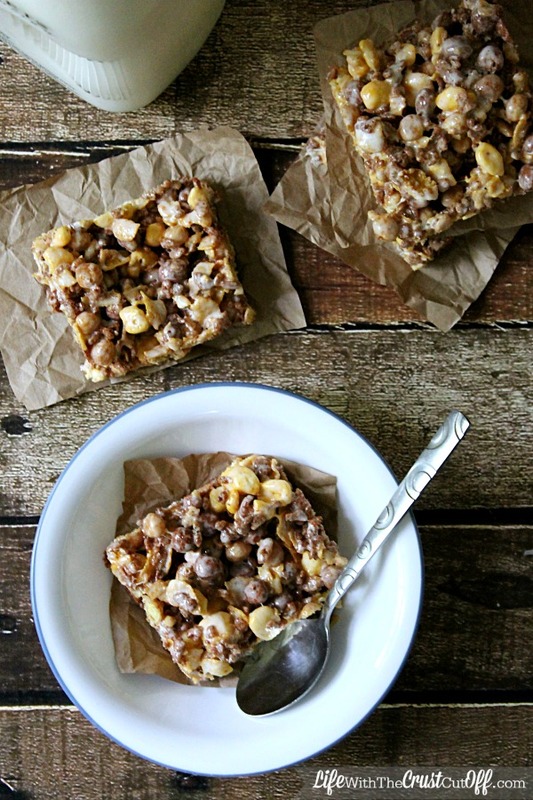 So we are here to give you some new ideas for yummy after school snacks! Back to school also means early mornings groggily pouring cereal into bowls for sleepy eyed children. Around here that means tons of boxes of cereal! 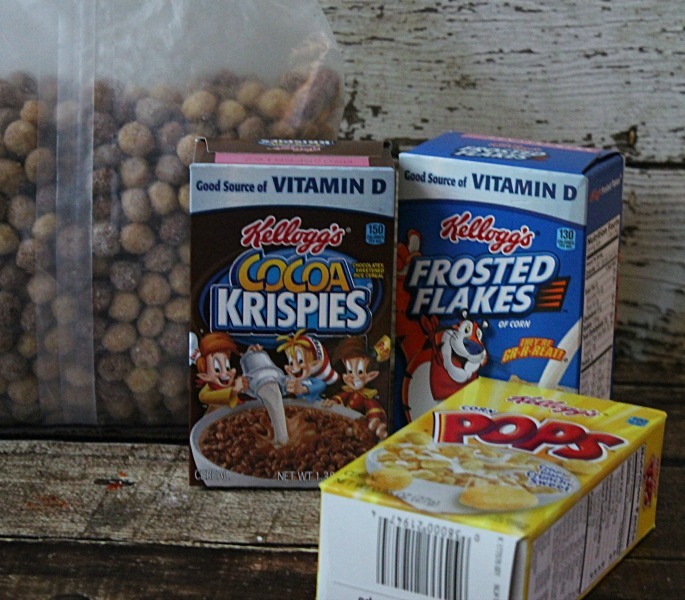 My kid wants a new cereal every week, or wants those little individual packs in which he only eats like 2 of, or they eat most of a box of cereal and no one wants that last bowl -_- So my pantry gets full of a little of this cereal, a little of that, a tiny box of this and so on. It drives me bonkers! So I have come up with a way to use up all those leftover little bits AND get a yummy snack out of it! I present to you Bottom of the Box Cereal Bars! 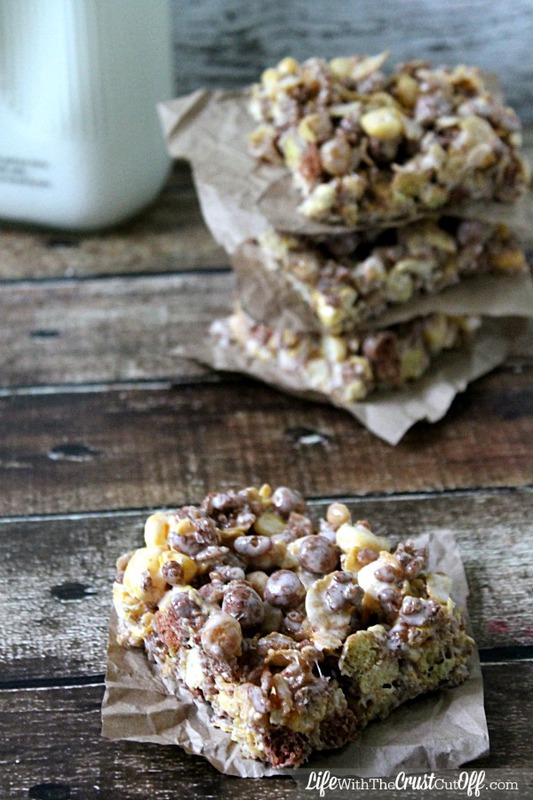 That’s right folks, just gather up all those mostly empty cereal boxes dump them all together, microwave some marshmallow and butter and 5 minutes later you have a delicious after school snack that is super quick to prepare, super yummy and gets rid of that leftover cereal! Now just try to pair like cereals together for this, don’t go mixing your Fruity Pebbles with your Cinnamon Toast Crunch, might not be pretty! Do pair your Fruity Pebbles with your Lucky Charms and Apple Jacks. 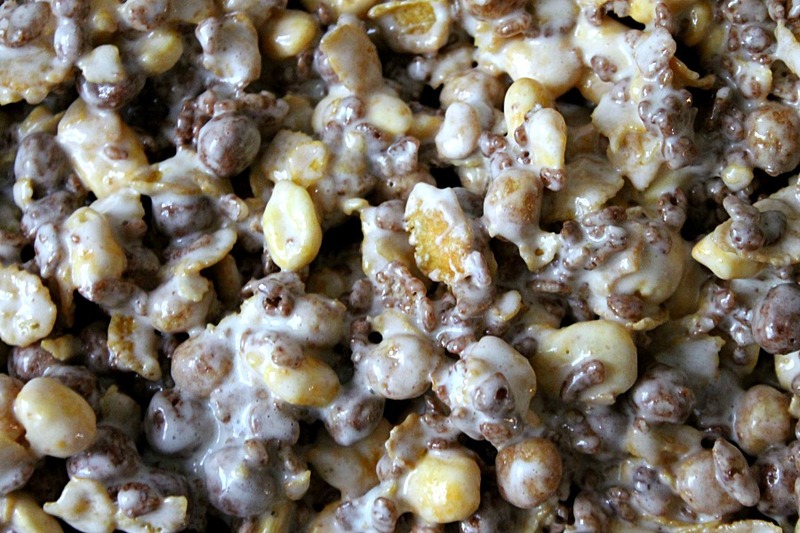 For my bars today I used Cocoa Pebbles, Frosted Flakes, Corn Pops and Reeses Puffs. Oh my yum these were awesome!! So don’t trash that little bit of cereal down the bottom of the bag! 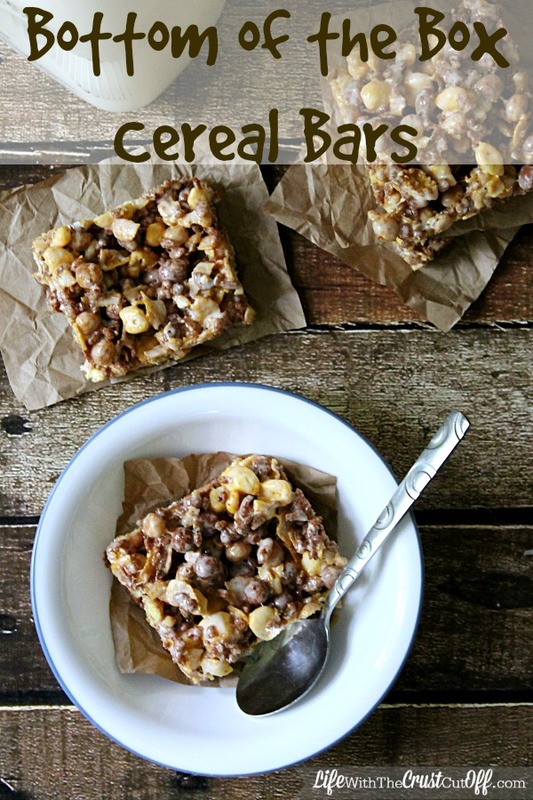 Give it a new life and create these awesome Bottom of the Box Cereal Bars for your kids after school snack! In a large microwave safe bowl melt the butter with the marshmallows in 30 second intervals till all melted and gooey. Immediately pour in 6 cups of your mixed cereals. Don’t forget to head on over to Dana’s and check out her No Churn Cereal Milk Ice Cream! Yum! Follow me on Pinterest for more yummy recipes!! I had to smile…I make trail mix with all the little bits of cereal left at the bottom of the box. I will have to make cereal bars now. Thanks! oh man these look good! Can you just use the whole box?!?! Thanks for linking to Create Link Inspire at The Crafty Blog Stalker. You have been featured and pinned! Thank you for sharing. Could you use puffins peanut butter cereal together with multi grain cereal or and possibly otherwise toasted wheat cereal,please reply would love to try and make . Of course!! You can use any cereal your family likes!